The Missouri River Basin is home to thousands of bird species that migrate across the Great Plains of North America each year, marking the seasonal cycle and filling the air with their song. In time immemorial, Native inhabitants of this vast region established alliances with birds that helped them to connect with the gods, to learn the workings of nature, and to live well. 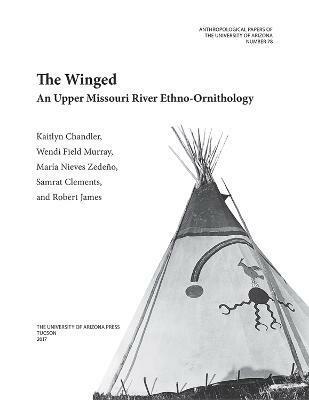 This book integrates published and archival sources covering archaeology, ethnohistory, historical ethnography, folklore, and interviews with elders from the Blackfoot, Assiniboine, Mandan, Hidatsa, Arikara, and Crow communities to explore how relationships between people and birds are situated in contemporary practice, and what has fostered its cultural persistence. Native principles of ecological and cosmological knowledge are brought into focus to highlight specific beliefs, practices, and concerns associated with individual bird species, bird parts, bird objects, the natural and cultural landscapes that birds and people cohabit, and the future of this ancient alliance. Detailed descriptions critical to ethnohistorians and ethnobiologists are accompanied by thirty-four color images. A unique contribution, The Winged expands our understanding of sets of interrelated dependencies or entanglements between bird and human agents, and it steps beyond traditional scientific and anthropological distinctions between humans and animals to reveal the intricate and eminently social character of these interactions. Kaitlyn Chandler is an anthropological archaeologist who received her master's degree in anthropology from the University of Arizona in 2012. She is a research associate at a museum evaluation firm in the Washington, D.C. area. Wendi Field Murray received her doctoral degree from the School of Anthropology, University of Arizona, in 2016. She works as a research archaeologist and collections manager at the State Historical Society of North Dakota. María Nieves Zedeño is a research anthropologist with the Bureau of Applied Research in Anthropology and a professor in the School of Anthropology at the University of Arizona. Samrat Clements received a bachelor's degree in history from the University of Arizona in 2007 and is currently building a career as singer and songwriter in Worcester, Massachusetts. Robert James is pursuing a bachelor's degree in Anthropology from the University of Arizona.